Thanks for the quick replay Desmond. I'm attaching some captures of my settings. Does it work if you use Safari or Chrome? I tried with Loopback 1, and it works here exactly as expected, no problems. What versions of OSX, Firefox, Loopback and Audacity are you using? 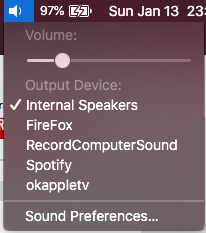 Does Safari and Chrome get audio passed into Audacity as expected, just FF doesn't? Does FF pass audio into some other audio application (not Audacity)? Does the demo of Loopback 2 work for you, or behave the same? Trying to rule out where the problem you are having is occurring. I have been recording anything that I can hear out of this 6/7yr old HP i3 laptop for years. "Stereo Mix" and into Samplitude SE8 but I am pretty sure I have done it with Audacity and AA1.5. Mainly radios 3 and 4 but the odd YT grab as well. I USED to be able to do it with a 2496 card (Mon Mix) in a desktop but post a trial of W10 and a revert back to W7, the old M-A control panel has gone and MMix with it. Still, the card comes up to TRS in a breakout box so I just patch across. I understand this easy/pc solution has been removed in W10? Maybe OP should look for a cheap,sh HP with W7? 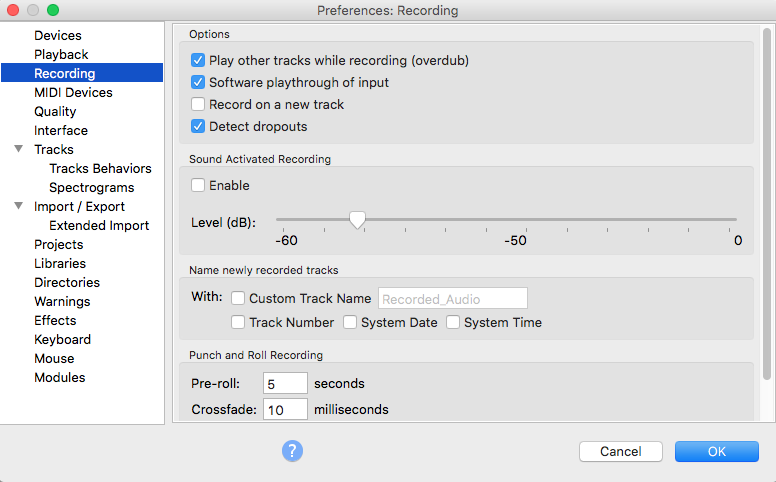 As I have mentioned many times, including on this thread, the best, easiest, slickest no-hassle solution for recording audio from apps on the Mac is Audio Hijack. 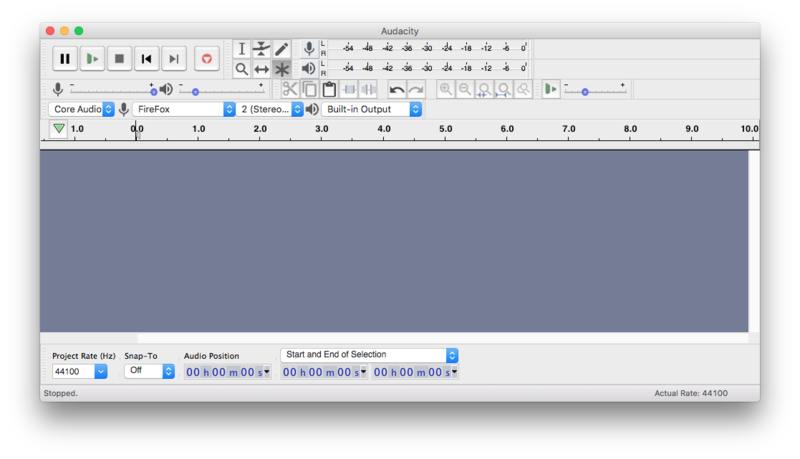 Loopbacking to Audacity is using two different apps, where Audio Hijack has the hijacking and recording (and inserting plugins if you want) all built in. 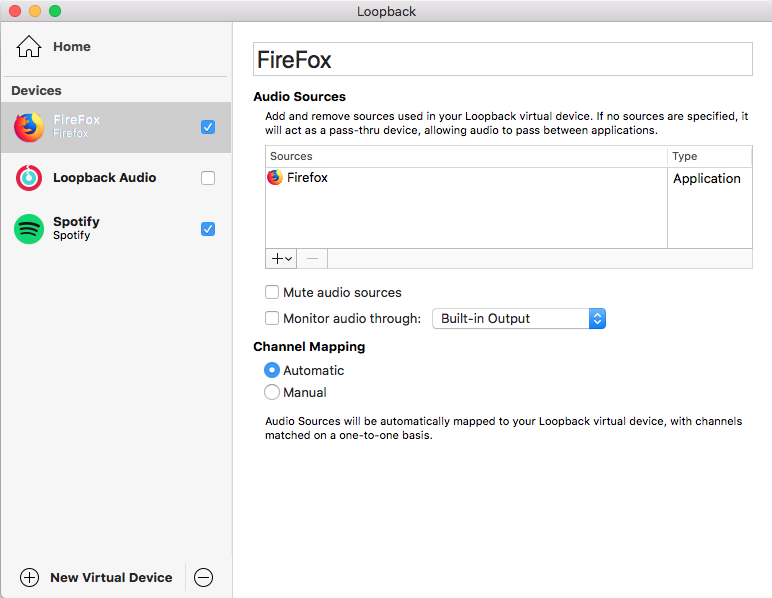 Loopback is really designed for people with complex internal routing needs (like recording podcasts from multiple sources and apps to multiple individual and mixed recordings) and it's overkill for just recording an app. It's also a lot more expensive than Audio Hijack, simply because it's target audience is much more niche. Well I'll be damned.Thank you! It works with Chrome but not with Safari (Version 12.0.2 (13606.3.4.1.4)) or FireFox (64.0.2 (64-bit)). This could be a workaround for my problem. I feel dumb for not trying it before. I'm on macOS High Sierra 10.13.6 (17G4015) which is the latest Version I can use since my macbook is an early 2011 model. It's not YouTube what I'm trying to capture, is a variety of web streams. I didn't know about this app, I stumble with Loopback browsing for a solution a year ago for a specific scenario I had and it worked fine (and yeah, I shoulda done more research) I just wanted to continue using it since I've already paid the license. Exactly this. I'm less stressed now that I found a workaround based on your suggestions. lojeda wrote: It works with Chrome but not with Safari (Version 12.0.2 (13606.3.4.1.4)) or FireFox (64.0.2 (64-bit)). That's very strange - audio capture from Safari at least should be well-tested and flawless (and has always worked fine for me). It might be worth giving Rogue Amoeba tech support a message and see what they say. lojeda wrote: I'm less stressed now that I found a workaround based on your suggestions. It's up to you whether the workaround is good enough, but I'd suggest you might want to try and get this sorted, as audio capture from web browsers is a great feature that should be bullet proof... and works here (on Sierra and all versions of OSX going back to Audio Hijack Pro 1.x). Not suggesting the OP should jump OS's Des' just a lighthearted suggestion that perhaps he should buy a cheap, low grade W7 laptop, set it up as I have mine, stick it in the corner doing its thang while he gets on with more interesting stuff? Or are there "Apple police"? There are, Dave, and if I were you I'd be moving to a new address and changing my identity round about now. ConcertinaChap wrote: There are, Dave, and if I were you I'd be moving to a new address and changing my identity round about now. Oh I'm ok, never so much as TOUCHED a mac and I keep all Apple software off my machines. Years ago #1 son installed iTunes and when I took it off I found the DVD player would no longer work! Well, if ever you do touch a Mac, beware!